The post Lifeline: Whiteout (iOS): COMPLETED! appeared first on deKay's Gaming Diary. Lifeline is the mobile equivalent of the choose your own adventure books I read as a kid. Cadet Taylor ship has crashed on a moon & he needs your help to survive & ultimately escape from the moon. I can't go into too much detail without spoiling the story but it had me hooked for a few days & I've gone straight on to play the next game in the series Lifeline Silent Night. 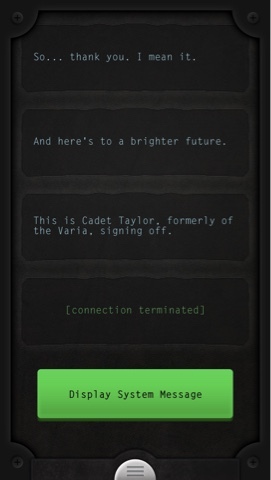 Lifeline is the mobile equivalent of the choose your own adventure books I read as a kid. Cadet Taylor ship has crashed on a moon & he needs your help to survive & ultimately escape from the moon. I can't go into too much detail without spoiling the story but it had me hooked for a few days & I've gone straight onto play the next game in the series Lifeline Silent Night. Look at this. I have not only completed a telephone game, but it was a telephone game that I had to buy with actual money. How rare. So rare, in fact, I don’t think I’ve done that in years. I gave up on the whole iOS game market ages ago as it was full of clones, IAPs and rubbish. Lifeline was recommended by the Midnight Resistance podcast, and sounded interesting. So I bought it. Remember text adventures? It’s a simple one of those, but integrates into your phone. It starts with you getting a notification (a real actual app notification too) from Taylor, a student scientist onboard a spaceship. Well, they were onboard. It crashed and somehow you’re the person Taylor’s communication device contacted. They tell you whats happening, and periodically they ask for advice or a decision. Sometimes they’ll disappear for (real life) hours at a time while they’re busy, for example hiking or sleeping, and then you’ll get another notification when they’re ready for another conversation. Your aim is to keep Taylor alive by choosing the best option for them (I keep saying them and they – Taylor’s gender is never given) and ultimately leading them to rescue. They can be directed to explore the not-as-barren-as-first-thought moon, and decisions are as simple as go east or west, or as stressful as fight or run. Yeah, they’re not exactly alone. Minor spoiler. I managed to kill Taylor a couple of times, but bar that it took maybe three days to beat the game and get them rescued. There’s not a huge amount of game there, but it’s spaced out (no pun intended) and somehow feels more real due to the phone integration and the way in-game things take real actual time to complete. An interesting diversion with an original concept, if not as great as I was hoping for. The writing is OK (and the story is right out of the sci-fi books I’d read as a kid), but Taylor’s humour doesn’t really fit with their situation. Still, you can spend 79p on much worse. The post Lifeline (iOS): COMPLETED! appeared first on deKay's Gaming Diary.